David Piper has always been an outsider. His parents think he’s gay. The school bully thinks he’s a freak. Only his two best friends know the real truth: David wants to be a girl. Wow.. just wow. I have to tell you, The Art of Being Normal is so far out of my comfort zone – and I think that made me love it even more than I already do. This book is a work of art itself. It is provocative, innovative, unique, and everything a contemporary novel should be. It has opened my eyes to something I knew little about. It has created a new set of standards. It is more than just diverse, it completely diverges from our idea of normal and thrusts readers into a situation some individuals experience every day of their living lives. 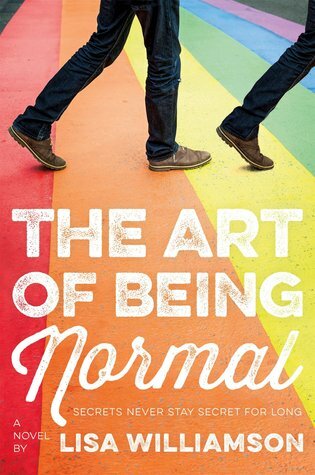 The Art of Being Normal focuses on David Piper (Kate), a young boy who has only ever wanted to become a girl. Even since kindergarten, he knew. When the teacher asked the class what they wanted to be when they grew up, there was a slew of standard ballerina and astronaut answers – and then there was David, who wrote something that broke the barriers of acceptable answers. While David’s closest two friends are supportive, the school treats him as a pariah and his parent have their suspicions though he hasn’t come out to them yet. This is the story of his journey and his growth – and it was beautiful. This is one of those books that grabs you by your wrists and ankles and drags you through the muck until the end. There is no escape. You find yourself trapped, captivated, and utterly willing to keep getting muddy. While you might be uncomfortable with certain aspects of this novel, I certainly was, you shouldn’t let that deter you from delving head first into a book that demands to be read. It’s worth it. Trust me. Ooh this only came out really recently for you! It’s been out where I am for ages. *nods* I did enjoy this, but I thought it did use a lot of typical self-discovery-acceptance-coming-out story tropes. (That was basically the story.) (Sorry. I have a lot of feelings about the diversity we need in fantasy and sci-fi.) But as far as those kind of books go I thought it was a good one!